223: Something to brag about. Hi friends! I don’t know how many of you read my other webcomic (Give it a try, it’s p good) but I’m taking preorders for the next book. I’m going to Katsucon next month and would really like to have the book printed for then. 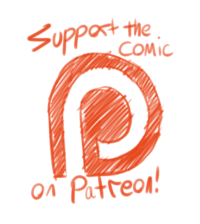 Otherwise if you like Sin Pararse and would like to help me keep making it please support me on Patreon. Right now Patreon is the majority of my income and clearly not enough to live on but with small subscriptions from enough people it could be. If we can get it up to the $800 mark I’ll post two Sin Pararse pages a week instead of just one.